There’s not much that makes me want to travel any distance outside of Sussex these days: the odd march against the cuts; the occasional football match; some walking in the Mendip Hills. But Sussex’s finest, British Sea Power, are a band that I’m prepared to make sacrifices for - even to the extent of forcing my family to go to a two day festival on the border of Kent and Surrey. That meant camping. With small children. Three of them. I don’t know who was more apprehensive, me or my wife. We are not natural music festival goers; she had never been to a festival and my solitary experience was at Glastonbury in 1981 (yes, 1981) and I still have the crooked nose to prove it. I’ve always preferred live music indoors in as small a place as possible but when the nascent New Order were slated to play second fiddle to Hawkwind (Glastonbury was still very hippy in 1981; not the fixture of the mainstream summer social calendar it is today), a few of us travelled down to Somerset in our post-punk raincoats to soak up the gloom. Despite some pleasant diversions - Roy Harper and Ginger Baker having a fist fight on stage; the Comsat Angels’ set – we were only really interested in New Order. And they were hugely entertaining: Bernard Sumner doing an impression of Norman Wisdom doing an impression of someone off their face throughout the set. The only problem was a hippy in front of me who kept jumping up and down and shouting for Hawkwind. I reasoned with him; he ignored me. I hit him on the head with a plastic scrumpy flagon; he headbutted me in the nose. So much for peace and love; good job I had as much sense and feeling as Barney that night. Leefest is an annual festival held in August on a farm between Biggin Hill in Kent and Warlingham in Surrey. It’s organised by a bloke called Lee and any profits go to the charity Kids Company. It started in Lee’s back garden six years ago and has since grown to the 2,000 capacity event it was this year. Commercial festivals are huge and expensive so finding out that British Sea Power were headlining on the second night of a small and relatively inexpensive festival (£55 each for us and free for the kids) meant that our summer holiday plans were sealed. When we arrived at the site it was clear that it was a real home grown festival: hand-painted signs, Lee’s friends and family acting as the staff, even the few security people were ridiculously cheerful. The kids were delighted to have orange bands fixed to their wrists that they couldn’t take off, not even to wash. We pitched our tent in the small family camping area, along with about six other families, and then cast our gaze across the main camping field only to realise that 95% of festival goers were closer in age to our children than us. Not to worry; as we found out over the next two days, everyone was very friendly and mostly considerate, and the organisers were keen to find out what families thought of, and wanted from, LeeFest. People on the staff stopped and spoke to us many times asking our views. We sort of forgot that young people don’t go to bed if they don’t have to. As a result, we didn’t get too much sleep while we were there, although our children slept through all of the music, singing and shouts of “Alan!” (evidently funny if you knew the reference – we didn’t) coming from the main campsite all through the night.Our kids had a great time: watching bands, eating fast food and ice cream and staying up late. The highlight for the boys was being around the midnight camp fire, organised by Lee’s dad Colin, watching the flames and sitting next to real teenagers. We saw lots of acts: new rave dominated on the Friday night with The Whip and Fenech Soler but some of the best bands were lesser-known: the lively electro-crooning of Miss Scarlett, the punky pop of Bordeauxx (bit of a red theme there) and the retro swing of Frankie and the Jacks all impressed. On the Saturday night, at the same time that British Sea Power were playing, the dance tent was headlined by DJ Fresh. The name meant nothing to me but he was evidently number one in the singles chart (they still do that?) in July, guaranteeing that the young people were all watching/ dancing to him. Seeing British Sea Power with only a couple of hundred people right in front of the stage was a real treat; not as intimate, I imagine, as the gigs back in May that I failed to get tickets for at the tiny Berwick Village Hall in East Sussex, though. 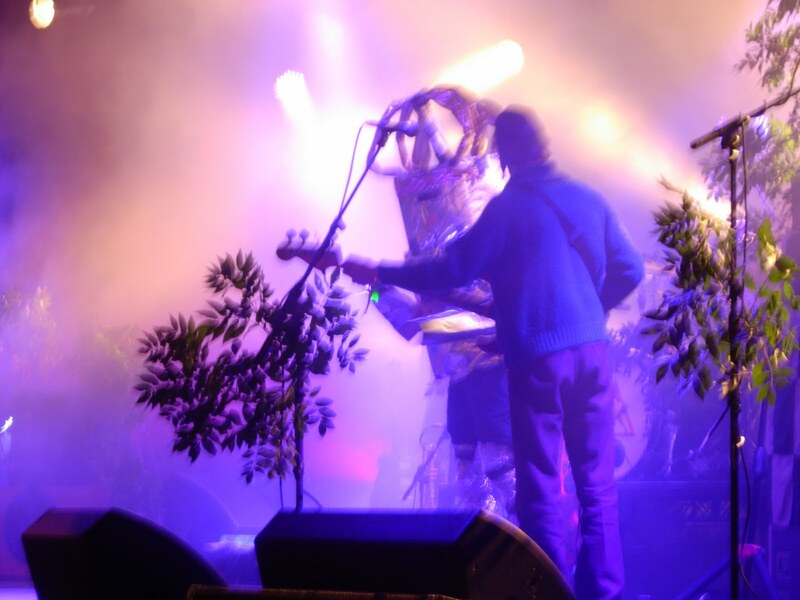 Despite having played in Budapest the day before, British Sea Power took to the Leefest stage – customarily bedecked with foliage - with all their usual energy, blasting through their call to protest ‘Who’s in Control?’ from the recent Valhalla Dancehall long player. Their set took in a variety of songs from the frantic hooks of ‘Remember Me’ to the stately instrumental magnificence of ‘The Great Skua’. When I last saw British Sea Power, I suddenly heard the song ‘Atom’ with fresh ears and realised the greatness of its two chord punk sensibility. At Leefest, it was ‘Georgie Ray’ from the latest album that revealed itself as a work of staggering genius. At once both fierce and tender, its plaintive refrain of “won’t you say something?” built to a stunning climax that volleyed through the warm August night like a prayer. By this point, much to my kids’ delight, the stage had long been filled with a cast of additional characters: Mr Fox, having appeared after the first number drinking, looking menacing and semaphoring with two wooden pigeons, was quickly joined by two robots - one called Titan. By the time of the ‘Rock In A’ finale, Ursine Ultra the 10ft bear was also part of the wildly dancing throng. Guitarist Noble, perhaps to escape the onstage melee, then perilously climbed the stage rigging as the strobe lighting turned my children into whirling dervishes.